Magnesium, unknown to most people, is a mineral used by almost every organ in the body, especially the heart, kidneys and muscles. If you experience constant fatigue which doesn’t go away or get better, or an overall weakness of the body, irregular or abnormal heart activity, muscle spasms and even eye twitches chances are you have low magnesium levels and chances are that it is the last thing you or your doctor have considered. Called the ‘invisible deficiency’ magnesium is stored mainly in your bones and organs, where it is needed and used. Blood tests will not pick up a problem because only 1% of the magnesium in your body is present in your blood, which means it is possible to be deficient and not know it. Undervalued as a mineral, magnesium is regularly thought of as something for your heart and bones but research has shown 3,751 magnesium binding-sites on human proteins, which simply put means you need more of it to do more than you thought; the role of magnesium with regards to health and the link to disease has been significantly underestimated. Dr Carolyn Dean, a medical and naturopathic doctor, has studied and written about magnesium for more than 15 years and the latest edition of her book The Magnesium Miracle was released in 2014. In it she discusses about 22 medical areas that magnesium deficiency triggers or causes, all of which have been scientifically proven. These include, amongst others, anxiety and panic attacks, asthma, blood clots, bowel disease, depression, diabetes, heart disease, kidney and liver disease, migraine, musculoskeletal conditions like fibromyalgia, cramps, and chronic back pain, and obstetrics and gynecology including PMS, infertility, and preeclampsia. Loss of appetite, headaches, fatigue and overall weakness are early signs of magnesium deficiency but they can be, and often are misdiagnosed, resulting in more serious symptoms, including numbness, tingling, cramps, seizures, abnormal heart patterns, coronary spasms and even personality changes. When it comes to preventing chronic disease magnesium plays a significant role, which most people aren’t aware of. Magnesium can also reduce the risk of impaired glucose and insulin metabolism and can slow down the progression from pre-diabetes to diabetes in middle aged people. It is also associated with higher bone density in men and women which plays a role in preventing osteoporosis. A study in Norway revealed a direct relationship with magnesium in drinking water and a lower risk of hip fractures. Natural sources of magnesium include green leafy vegetables like spinach and Swiss chard as well as some beans, nuts and seeds. Avocados also contain magnesium and juicing your vegetables can increase your intake, but most foods today are magnesium deficient so you won’t necessarily get your recommended daily dose by only eating your vegetables. One sure way to increase your magnesium is by juicing your greens. It is easy and a primary source of the mineral for many. Unfortunately it is difficult know which vegetables are magnesium-rich and which aren’t; even organic foods Supplements are available too but you need to be aware of how and how much magnesium is being taken in and being used. There’s simply no such thing as a 100 percent magnesium supplement. Another method of improving your magnesium count, besides a supplement or juiced vegetables is to take regular baths or foot baths with Epsom salt. It is a magnesium sulfate that is absorbed through your skin, into your body. 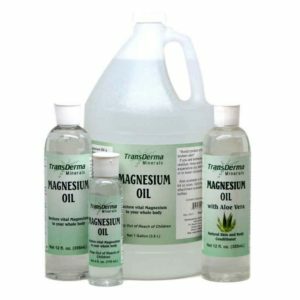 Magnesium oil can be used for absorption. Be sure to avoid anything that has magnesium stearate, a potentially hazardous additive.The majority of people are suffering from magnesium deficiency and this is why. Stress and prescription drugs are two of the major factors that drain magnesium from your body: stress and prescription drugs. Conventional medicine unfortunately is the reason for this and it then becomes a vicious circle according to Dr Dean. The scenario she gives is one you know all too well. You feel run down and stressed out so you go to your doctor. Stress means you are losing magnesium. You are burning magnesium out of your body because it supports your adrenal glands. It assists in keeping you away from depression and anxiety. It relaxes your muscles. You’re stressed, therefore your magnesium is being lost, which means the muscles of your blood vessels tighten. The tightness causes increased blood pressure. Your doctor sees this and prescribes a diuretic. The diuretic helps your blood pressure drop but it also depletes your body of magnesium. You go back to see your GP and he sees your blood pressure is even higher than before – because you’ve lost more magnesium. Guess what your doctor does? He puts you on a calcium channel blocker, which is partly correct because without magnesium oil the calcium levels are going to increase and tighten your blood vessels; the calcium does need to be blocked but magnesium is a natural calcium channel blocker. Magnesium deficiency is also a common symptom in diabetes, so drugs possibly contribute to diabetes simply by draining your body of magnesium. Of particular concern is fluoride, which is used in a variety of different drugs including certain medications for anti-anxiety, painkillers for arthritis and cholesterol medications. Magnesium binds to fluoride which forms magnesium fluoride and that does an excellent job…of draining magnesium from your body. Prescription drugs can also increase chronic inflammation, while magnesium is an anti-inflammatory nutrient. Again, too much calcium without enough magnesium will be counter effective and actually contribute to heart disease; this is why it is very important and necessary to maintain the correct balance of magnesium to calcium. Purdue Insulin Syringes May Help Patients with Dosage Concerns | How Much Does LASIK Eye Surgery Cost?